Vonage Mobile App for iPhone, Android | Free app to app calls | Free Pc to Phone Calls, Free Voip Calls to India International ! Now every other voip provider, telecom provider is trying to capture the market by offering its mobile calling app. This is simply because a large number of people have switched to smartphone and like making voip calls : which are free. Vonage is now trying to attract skype customers and it has announced the launch of its new calling app for Android and iOS devices. Vonage Mobile calling app features free app-to-app calling and cheap international calling rates. It is being said that on average the calling rates are 70 percent less than major mobile carriers and 30 percent less than Skype. That's a big difference I guess. The good feature about Vonage app and other such applications is that is allows you to talk and text to other people who are using the same app. 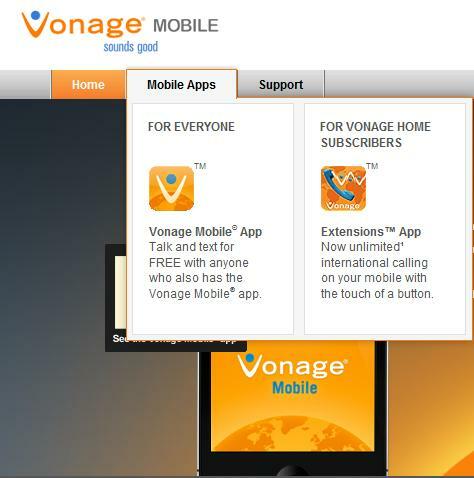 Vonage also allows Free app to app calls as well as free text messaging between vonage app users. It also has wideband HD audio for better audio quality. One more good feature about Vonage mobile app is that you can use your existing address book and there is no need to leave the app. The app works on both Wi-Fi and 3G/4G. Calls made from Vonage app uses your mobile number as your caller ID. This feature is not available on many other applications, so its a plus for Vonage. Also, in order to know which of your contacts have Vonage app installed, just check your contact list. Your contacts with a Vonage are shown with "V" logo next to contacts and are a free phone call away! Any one can install this app. Calls to any Vonage number are also free. To encourage usage of this new app for a limited time any phone number in the United States, Canada or Puerto Rico from will be free. So, if you are outside US and want to make free calls to your family or friend in USA, install Vonage app and make free calls to USA. Vonage Mobile app for iPhone. Vonage Mobile app for Android. The configuration for an android application depends upon its connectivity to various internet media.